Congratulations to the WVHS students for their success at the sub-regional Junior Science and Humanities Symposium. The Warwick Valley Science Research students had an amazing day at the sub-regional Junior Science and Humanities Symposium! 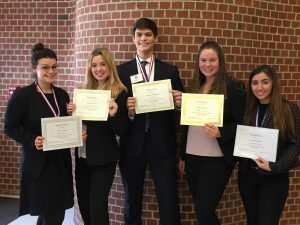 The first and second place finishers will now move forward to the regional competition in Albany on Wednesday, March 27 and Thursday, March 28. The Junior Science and Humanities Symposium (JSHS) is designed to challenge and engage students (grades 9-12) in science, technology, engineering and mathematics. Students compete for scholarships and recognition by presenting the results of their original research efforts before a panel of judges and an audience of their peers. JSHS is a collaborative effort with the research arm of the Department of Defense and administered in cooperation with nationwide colleges and universities.